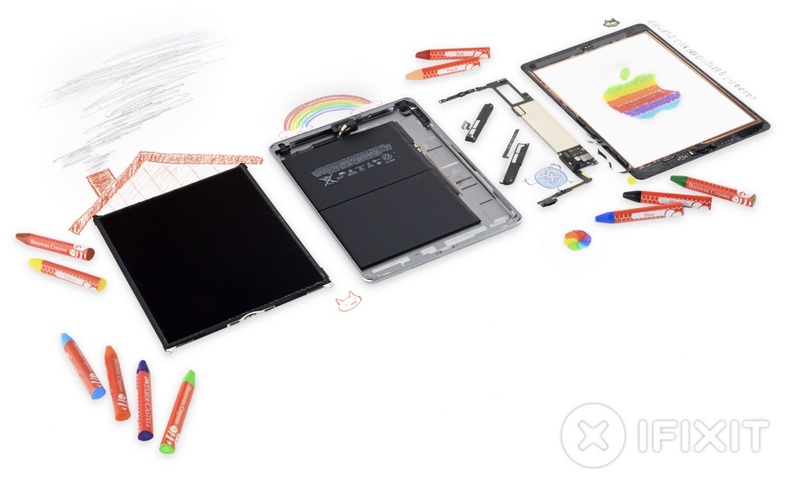 iFixit today published its teardown of Apple's sixth-generation, education-focused iPad and found that -- unsurprisingly -- the tablet shares many of the internals of the fifth-gen iPad. The teardown crew also looked at the new iPad's potential for durability and repairability in an education environment by comparing it to competitors in the field. The new iPad's lack of waterproofing, non-replaceable charging port, zero upgradeability, and use of glue throughout the internals added up to a "repair nightmare." iFixit then pointed towards the HP Elite x2 1012 G1 tablet, which got a perfect repairability score of 10 out of 10, summarizing that "Apple's 'education' iPad is still a case of won't — not can't." Looking into the iPad's internals, the two major updates in the new tablet are an upgraded A10 processor and Broadcom chips for Apple Pencil support. iFixit got a peek inside the iPad using Creative Electron's X-ray imaging software, discovering "only minor differences" when compared to a similar X-ray of the previous iPad. One of the iPad's advantages in terms of repairability comes in the form of its digitizer panel easily separating from the display. iFixit pointed out that in the event that either component should break, repair will be easier for schools and educators. Eventually, iFixit got down to the logic board and discovered the iPad's A10 Fusion processor and two Broadcom touch screen controller chips, previously found in the 10.5-inch and 12.9-inch iPad Pro models. iFixit theorized that the new iPad's Apple Pencil support "comes in part thanks to this "Pro"-grade chip." The sixth-gen iPad has the same battery as the previous model, with 32.9 Wh capacity. iFixit noted that while this allows Apple to reuse existing manufacturing lines to reduce waste, the battery is still locked behind a "repair-impeding adhesive" that greatly reduced the iPad's repairability score. Apple has provided easy battery removal before, in the 12.9-inch iPad Pro, but iFixit hasn't seen anything like it since. Ultimately, iFixit gave the 2018 iPad a repairability score of 2 out of 10, favoring the fairly easy repair options of its air-gapped, non-fused display and digitizer glass, but taking marks off for its heavy use of adhesive and sticky tape. To read the full teardown, visit iFixit.com. While I have no bone with the claims, what iPad has ever been "repairable"? I can't think of anything out of Apple's stables in the past decade that has been highly repairable. On the other end, how many Chromebooks are repairable, even if they are, why not just replace them since shop time and costs to repair a Chromebook may get close to a new one. Oh, there are plenty of stories believe me. I've dealt with enough. fixit is just on another one of its let’s get some clicks anti-Apple rants. What for reporting the truth on how repairable these things are? News flash to ifixit, this is just an update to the consumer iPad with a slight discount to schools. Somehow schools are using iPads now without stories of durability issues. ifixit is just on another one of its let’s get some clicks anti-Apple rants. They do this with every Apple product. Because they have an agenda. The harder it is for users to repair their own stuff the fewer repair kits iFixit sells. If the screen breaks it can be repaired, and the battery will last 5 years. What else needs to be repaired? Repairabilty is almost a liability these days. When my daughter got a Chromebook at her school, I went out and bought the same model for myself - Acer C740. I read that (compared to the C720) the C740 model was more aimed at the "educational" market, and so had things like more durable hinges, thicker plastic, etc. It was designed to survive falls and abuse. Besides all that, I fount the thing dead-simple to work on. The top pops apart, held together by plastic clips. I was easily able to replace the basic TN display with a vivid IPS display. The bottom is held together by a few screws. You can easily remove it and service the insides. The internals are user replaceable, such as the SSD (M.2), the fan, logic board, and battery. In fact, I yanked its original SSD and slapped in a 256 GB one. They are so user-serviceable that they actually have the students themselves provide repairs. They take broken systems to a room where the kids salvage parts from them to repair and rebuild other damaged systems brought in. * durable *and* easy-to-repair hardware, with a "clamshell" design that protects its display. * a built-in pointing device and full keyboard. * a full "Desktop" experience browser, with support for plugins and Flash. * something that can easily sit on a desk and be used, without someone needing to constantly hold it. * a locked-down, secure, automatic-updating OS with a seamless and quick "A/B" update system (iOS doesn't even have that). * includes no keyboard or pointing device. each requires a separate purchase on top of the already-higher base price. I don't think the newest "iPad for Education!" thing they are attempting will be enough to fight off Chromebook. iPhones are repairable. They've almost always gotten good repairability scores. iFixit teardowns and repairability scores aren't about whether a company makes highly repairable items. They are there to inform the DIY'er of the difficulty of a specific undertaking. Is ifixit even relevant anymore? Yes, everything Apple makes, has made for quite a few years, and ever will make will earn atrocious repairability scores, because the products aren't made to be repaired anymore. Why is this news? It's like ifixit is just trying to stay in business. Not trying to stay in business iFixit promote user repairability. I have repaired and upgraded countless Mac products with some guidance sourced from excellent iFixit tutorials. Yes users could at one time easily repair and service their own Macs but that was before Tim Cook and when Apple became driven by money and greed. Remember if the user can repair it then the opportunity is there to help reduce illegally dumped eWaste. But guys Cook just said they really care about customers, also keep in mind this is the best "low end" ipad ever created! I never considered an iPad repairable, even if they are. Seems that compromising the shell would lead to problems sooner or later. I find it strange how some people dismiss the role of ifixit. Even if this new iPad is as (un)repairable as the old ones, it is still important for customers/schools to know to get a more complete picture. No one should base his buying decision solely on what the manufacturers tell you.